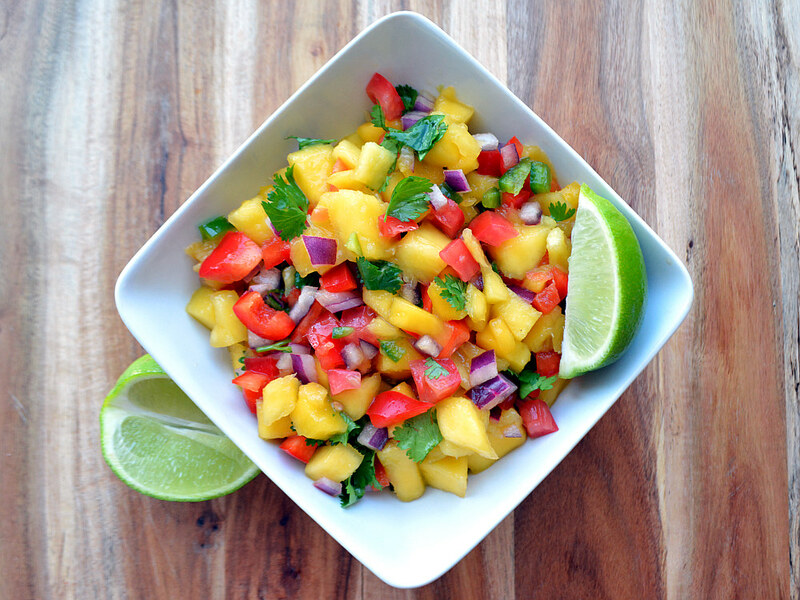 There’s no better way to bring the beach to your BBQ than to make a batch of Tropical Mango Salsa! It infuses fresh, tropical flavour into any dish and also makes for a tasty appetizer when paired with organic corn tortilla chips. Don’t forget the guacamole! I made this mango salsa as a topping for chicken fajitas this weekend (recipe coming later this week!) and it was phenomenal! It’s sweet with a hint of spice and combines deliciously with the chili spice in the fajitas. Mango salsa is a perfect topping for grilled chicken breast, pork tenderloin, grilled fish, hamburgers and other meaty dishes. 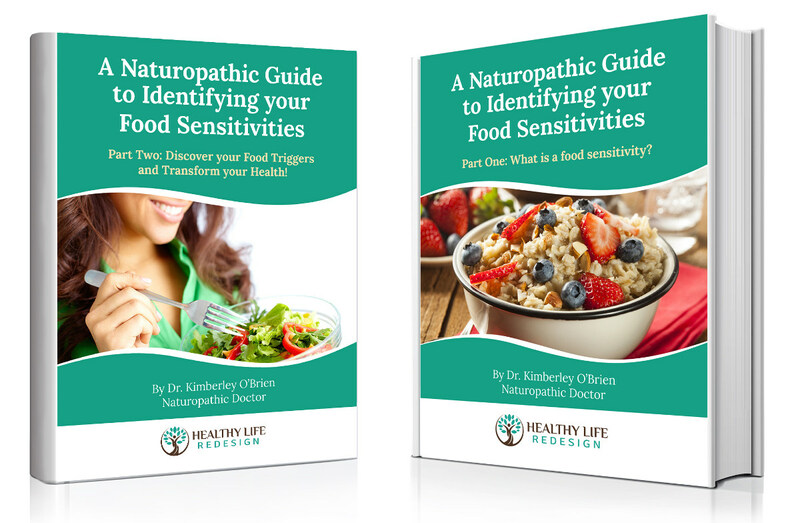 It also makes an absolutely delicious topping for black bean burgers or veggie burgers. 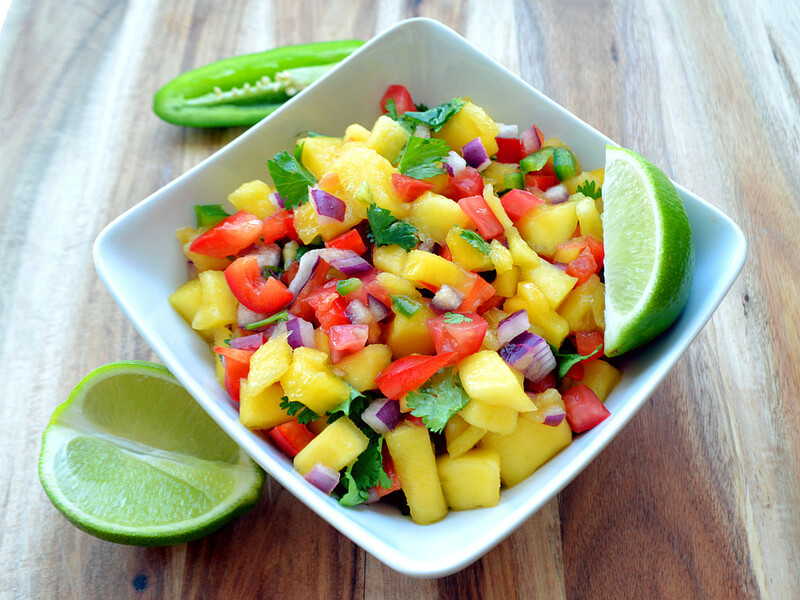 For a lighter meal, add some mango salsa to your salad and turn it into a taste bud tantalizing tropical experience! I made this mango salsa as a topping for chicken fajitas this weekend (recipe coming later this week!) and it was phenomenal! It’s sweet with a hint of spice and combines deliciously with the chili spice in the fajitas. Mango salsa is a perfect topping for grilled chicken breast, pork tenderloin, grilled fish, hamburgers and other meaty dishes. 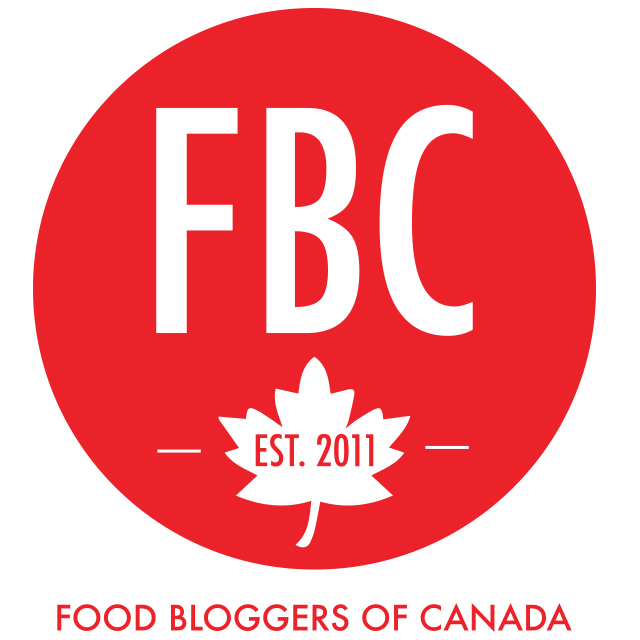 It also makes an absolutely delicious topping for black bean burgers or veggie burgers. 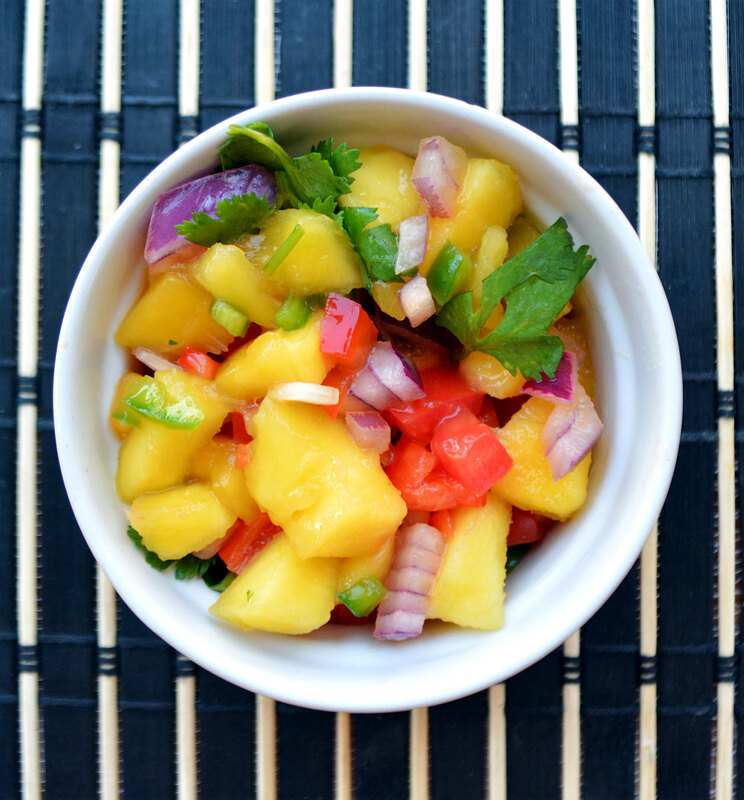 For a lighter meal, add some mango salsa to your salad and turn it into a taste bud tantalizing tropical experience! Mangoes are rich in vitamins A and C as well as carotenoids like beta-carotene, all of which are important nutrients for healthy hair and skin! What a delicious way to infuse your body with vitamins and minerals while enjoying this sweet yet savoury salsa recipe. How do you know if your mangoes are ripe? A ripe mango will give slightly under gentle pressure (similar to a ripe peach or avocado) and should not be hard. A ripe mango not only tastes much sweeter, but it’s also much easier to cut and prepare! Here you can find instructions on how to easily dice and prepare your mangoes for quick and easy salsa preparation! Homemade salsas are simple to throw together while allowing you to skip the added sugars and preservatives found in store bought varieties. 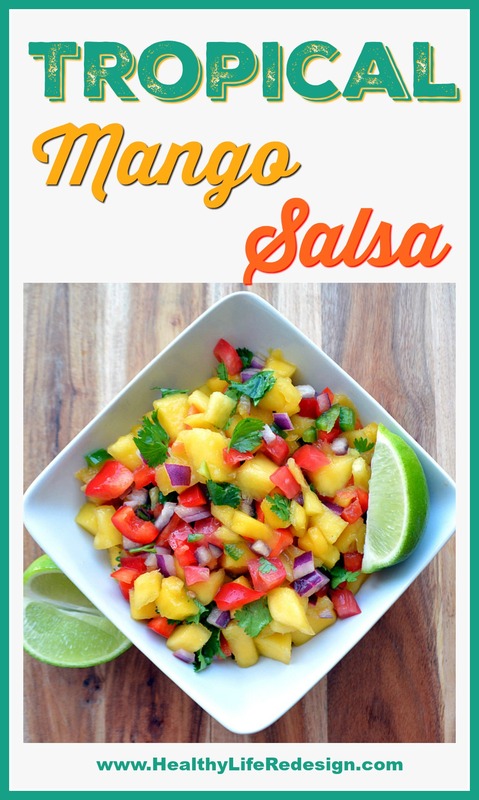 Give this mango salsa a try and please comment below to let me know how it turns out! 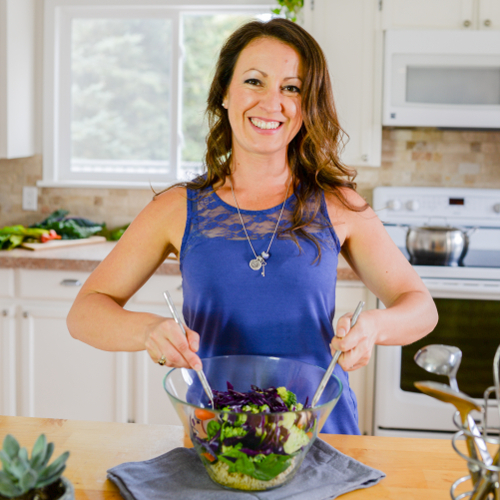 Chop and prepare all ingredients as directed above and combine them in a medium sized mixing bowl. Cover and let sit on the counter or in the fridge for 1 hour before serving for maximal flavour (optional).